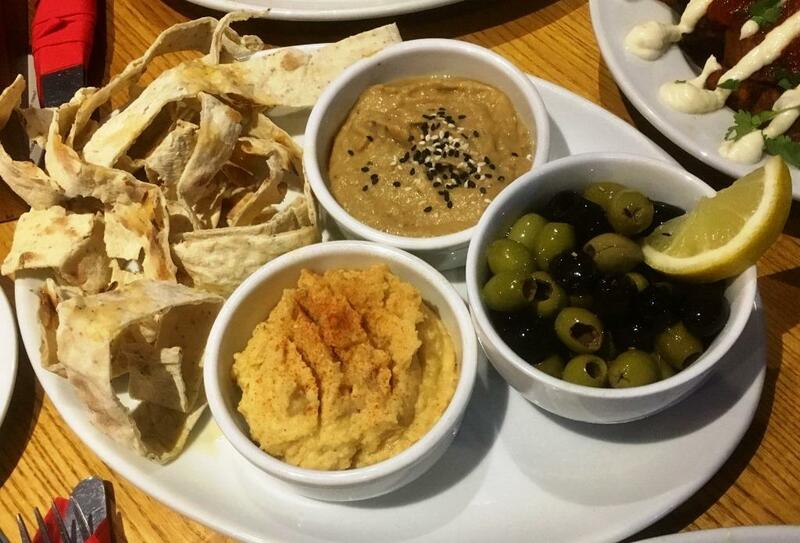 Ever wondered where you can find vegan food in Newcastle? And eat out as a vegan? Eating vegan food whilst out is not always the easiest thing to do. 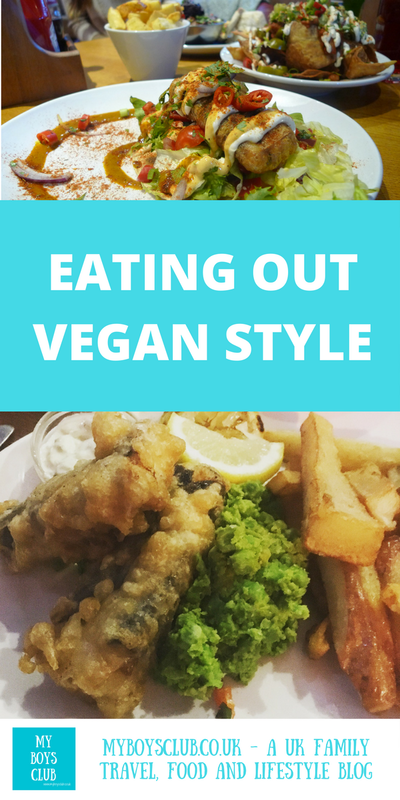 So as January is increasingly becoming known as Veganuary I thought I'd share our recent experiences of eating out in a dedicated vegan pub with you. The pub is The Ship Inn, Ouseburn, Newcastle - luckily for us less than half a mile from our home! Veganuary is a charity inspiring people to try vegan for January and throughout the rest of the year. It's not everyone who has the good fortune to have a dedicated vegan eatery on right on their doorstep, so during the festive period and ahead of Veganuary we took advantage of having Grandparents staying to mind the children as we had not one, but two lovely evenings out at one of our local pubs, a vegan pub, The Ship Inn, in the Ouseburn Valley in Newcastle. Located in the Ouseburn Valley, under Byker Bridge, The Ship Inn is one of the only pubs I know of that has an entirely vegan menu. Imagine going out, ordering food and not having to ask whether its suitable for a vegan to eat. You too can have this experience in Ouseburn. 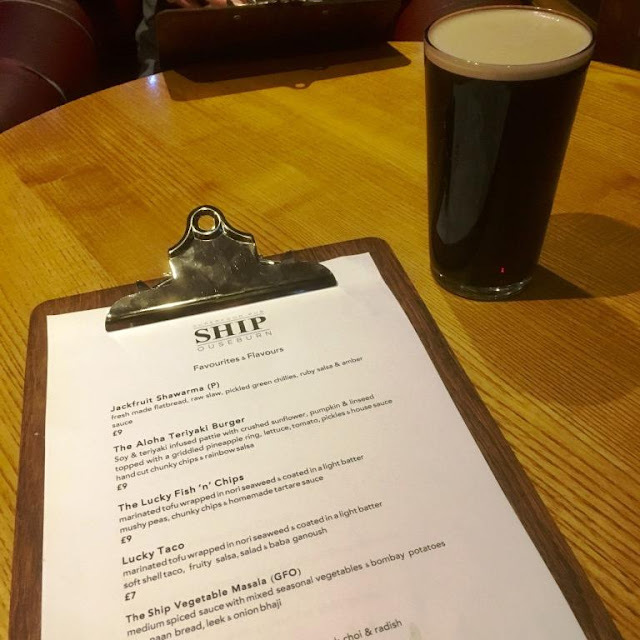 It's a family-friendly pub situated in the heart of the Ouseburn with a Vegan kitchen, real ales, cask ciders, cosy indoor or outdoor seating and it is also dog-friendly. 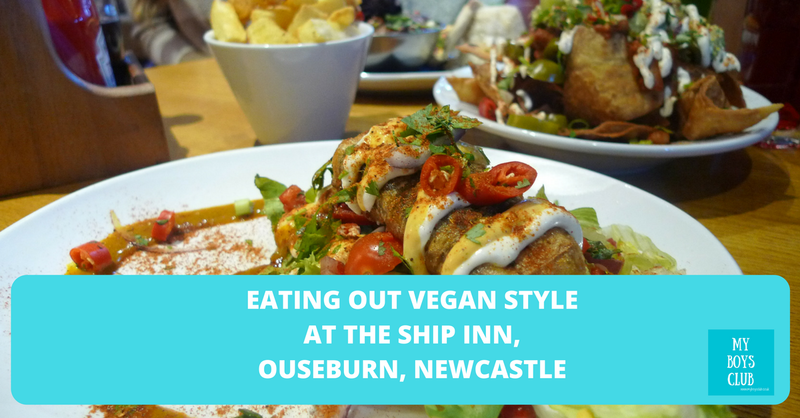 Last year we reviewed The Bohemian, a vegan and vegetarian restaurant in Newcastle Cty Centre which inspired me to try out some of their recipes at home, like Peking 'Duck' made from Jack Fruit and Mushroom Quesadillas, but The Ship Inn is the first vegan pub I've ever been to. I've been vegetarian and not eaten meat for over 30 years, I occasionally eat fish but often live on dishes which are actually vegan. You could say I'm an accidental vegan for quite a lot of the time! Nevertheless, the opportunity to eat out, and eat vegan is one that I'm very grateful to be able to do so easily. Last time we tried to eat at The Ship Inn they had unfortunately run out of food - it was a later on, on a Sunday afternoon. This time we were in luck. Although a good number of people were in the pub, we found a table straight away and looked over the menu. On the menu, you will find traditional pub grub with a difference. The difference is that it is all vegan! There is fish and chips, burgers, curries and nachos as well as desserts too. These we are yet to try. I had visited for lunch with a friend on November 5th and I already knew the 'Lucky Fish' was an amazing dish. That time I had it as a Taco, this time both me and hubby opted for the full Lucky Fish & Chips and also ordered Nachos to share. I say a 'sharing dish' - it was actually for one - I hate to think of the size of the actual sharing dish! Lucky Fish is tofu, wrapped in seaweed and then deep fried in batter. 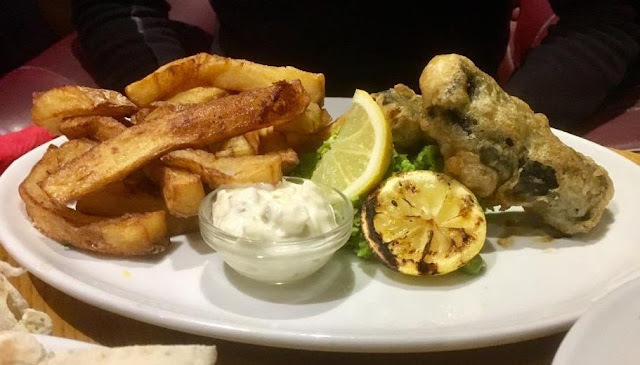 I can't tell you how good it is except I've now been to The Ship Inn and each time had the fake fish - it's that good, even though there is a whole full menu to choose from I always want to eat that! On our second visit, hubby again opted for the Lucky Fish & Chips. 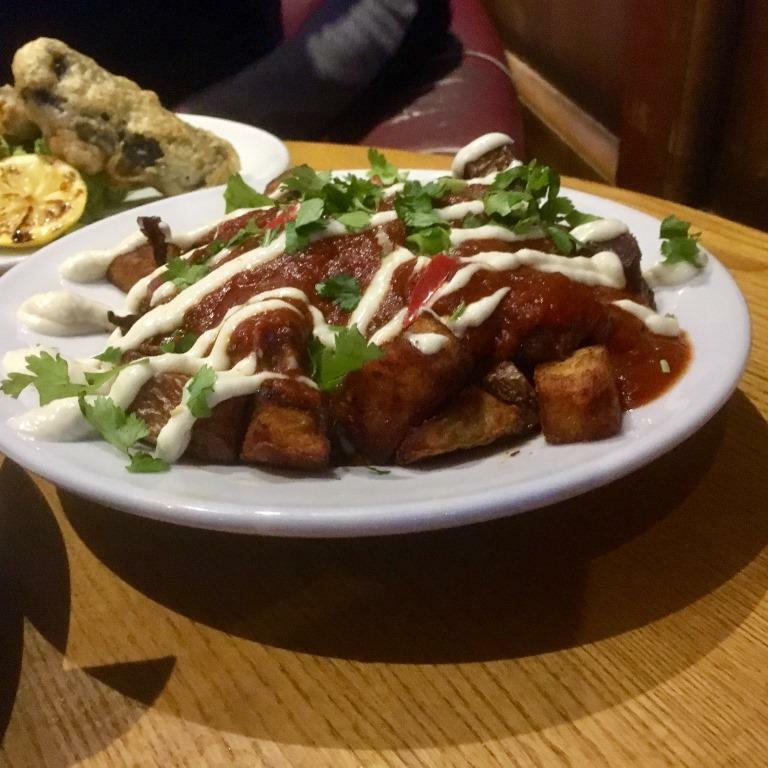 This time I went for the Lucky Taco again, with Patatas Bravas, which we shared along with a plate of hummus and olives. The portions are very generous, tasty and you totally forget you are actually eating vegan dishes. It's not vegan food it's delicious food that everyone can enjoy and everyone should try, whether they are trying to do Veganuary or not. 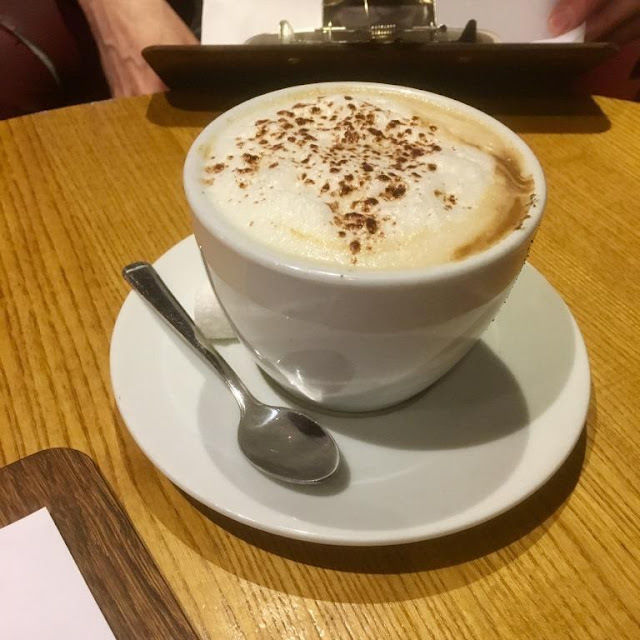 Both times I had a pint of Christmas Chaos and hubby had a pint of Wolf and a coffee (with non-dairy milk) the second time as he was driving. We'd both drink them again. Please note I don't think all drinks are vegan but plenty of them are. The Ship Inn also had a great collection of games to play. We've enjoyed playing dominoes, noughts and crosses, Connect 4 and also Trivial Pursuit on our visits. Battleships next I think! Living in Ouseburn is amazing. 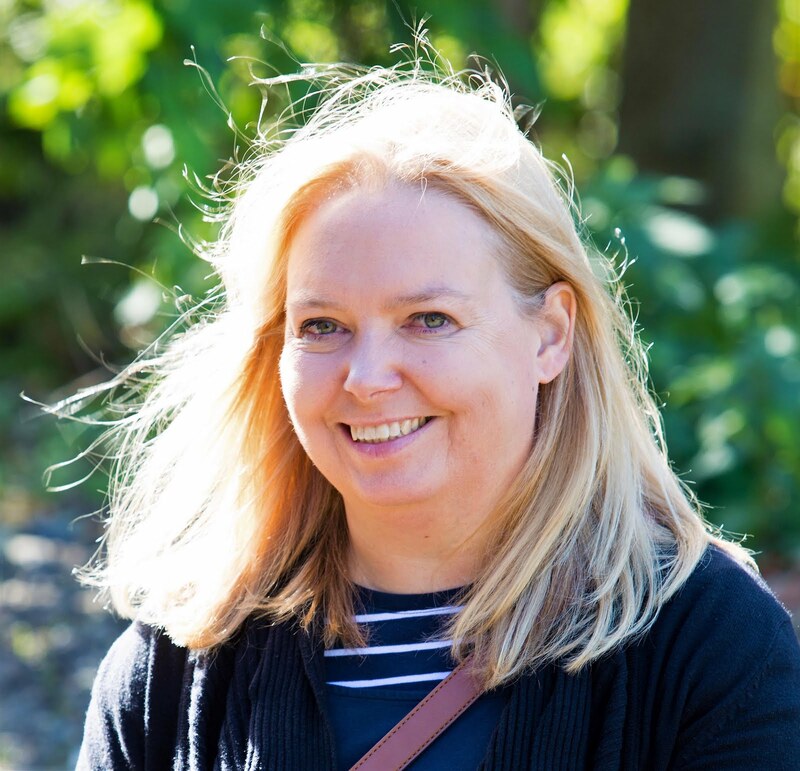 We are close to the city centre, have great pubs and attractions such as Seven Stories, the National Centre for Children' Books, on our doorstep and a great selection of pubs and eateries too. One of the newest is The Kiln on Hume Street and we stopped off here for a cocktail on the way home. I call the Kiln a pub, it serves alcohol and food but is also a pottery studio! I know how random this all could sound, but this eclectic mix of places is what makes the Ouseburn Valley, in Newcastle, the great place that it is. Anyway, I can totally recommend the Bloody Mary and the Espresso Martini cocktails! The North East Vegan Restaurant Week in association with Canny Food Blog will be running at a number of eateries across the North East from 8th - 14th January 2018, so you may find some places serving vegan food that you may not usually expect to offer meat and dairy-free dishes. What is your favourite vegan dish?